It's certainly no secret that fall bass fishing is synonymous with big topwater explosions. As the bass follow the baitfish migration to the backs of the creeks, they become especially aggressive and are more than willing to attack a strategically placed topwater lure. That doesn't necessarily mean, however, that you can afford to be haphazard in your lure selection process. A methodical approach and solid understanding of when and where to use each lure will help you quickly put the odds in your favor. If you stick with the following lures, you'll have an excellent shot at capitalizing on some of the year's best bass fishing. 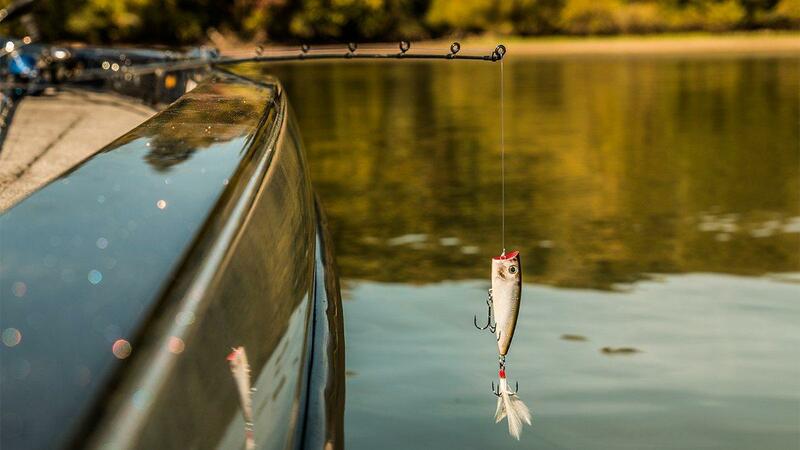 If you haven't been on the water for a few days, it can be a little tricky to relocate fall bass. They become rather nomadic this time of year as they chase those migrating baitfish, so they can certainly move a surprisingly long way within a matter of hours. If you find yourself in this type of situation, a buzzbait is an outstanding tool to use. Buzzbaits give you the unique ability to quickly cover water while you're searching for reaction bites. As you work your way down the bank, make long casts in front of your boat and reel just quickly enough to keep the buzzbait on the surface. If there's a bass nearby, it will have a hard time resisting the constant clacking and squeaking. These lures can be especially effective when you're faced with a fall drawdown, which is common on many reservoirs this time of year. As the water drops, crawfish that were once hiding around submerged rocks will scurry back down to the water and the bass know what's up; they'll sit in just inches of water and ambush those crawfish as they re-enter the water. A lot of times when you see fall bass nearly beach themselves attacking prey, they're actually chasing crawfish, not the shad like many anglers believe. With that being said, don't be hesitant to cast your buzzbait into super shallow water; it's all about covering water and finding active fish quickly. Other high-percentage targets include boat docks (both floating and pier docks), isolated laydowns and rock transitions. No bass angler should be without a walking topwater while fishing this time of year. There are lots of crazy colors on the market these days, but my suggestions are actually pretty simple: Go with a bone (white) color in overcast conditions and switch to a chrome or silver color when the sun comes out. These two colors will get the paint chewed off if you can find baitfish activity near the surface. Walking topwater lures are my No. 1 option whenever I see any sort of flickering or schooling action on the surface. This activity is indicative of shad, which of course, are the featured dish of the menu throughout the fall months. Make a long cast past the activity and work the lure side-to-side through the heart of the action. When you catch one, be sure to quickly release it so you can get back to fishing; it's not at all uncommon to catch several fish in a row when you run into this scenario. A quick release and follow-up cast will help keep the school fired. You can also use them to cover water quickly. While I prefer a buzzbait because of the speed at which I can fish it, walking topwaters are a strong secondary choice if you're getting a lot of short strikes on a buzzbait. 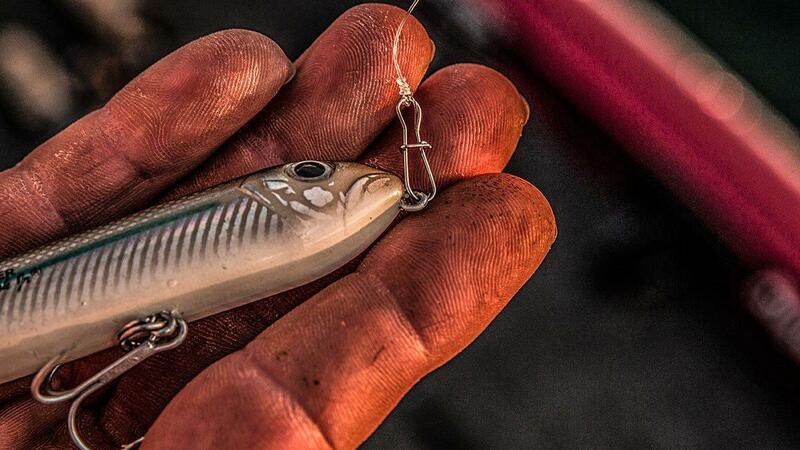 These lures are a bit more subtle and slower than buzzbaits, which can result in more hookups if you're faced with finicky fish or a surprise weather front. Honestly, you can start at the mouth of a small creek or pocket and expect bites just about anywhere with these lures. But the high-percentage spots include primary and secondary points, shallow docks with brush and shallow flats in the back-end of pockets. A lot of folks have a few poppers in their tackle box, but it's important to understand their proper role when you're fishing in the fall. They're meant to be presented at a slower pace, so many anglers overlook them this time of year. In short, poppers are my choice when I'm keying in on specific targets. I'm not going to chuck 'em across a point when the bass are breaking, but when the action slows down a bit, these lures really shine. I think these lures are great at irritating otherwise inactive bass. I'll make a cast past my target and slowly work it over the desired area. Instead of a constant twitching retrieve, I'll use a more irregular cadence to trigger reaction strikes; I'll walk and pop it for a few feet, pause it, pop it a few more times and perhaps let it sit completely still for several seconds while the rings dissipate. It seems as if most of my bites come when I make the popper do something different, which tells me that the bass will often follow these lures for several yards before finally committing to them. You'll have a lot of success by targeting irregularities with these lures. For instance, any stump, rock or laydown positioned by itself is a prime target. I also fish them around irregular points and pockets found on relatively straight grass lines. I'm not talking about giant points, either - I've caught some of my biggest popper bass by targeting irregularities roughly the same size as this keyboard I'm pounding on. I feel like fall frogging articles are way overdone, but man, I just couldn't not mention it in this list. If the previous options don't get you excited and you'd rather lean on 'em with a broomstick-type rod and heavy line, a hollow-bellied frog will allow you to do just that. In the fall months, you'll find matted vegetation on a lot of fisheries and the other baits we've talked about simply won't cut it. That's when you can break out your favorite frog and start wrestling with them. 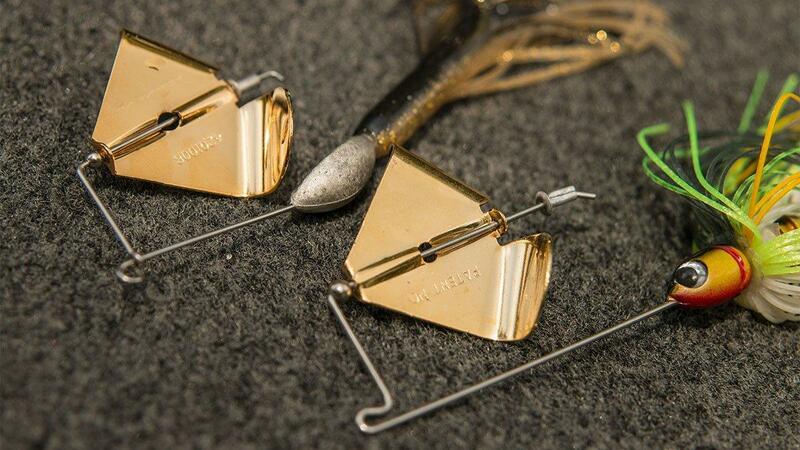 You'll hear a lot of anglers talk about "cheese mats". They're essentially referring to an almost-bubbly mixture of moss, thick weeds and clean grasses that creates a foamy, flexible layer on the surface of the water. 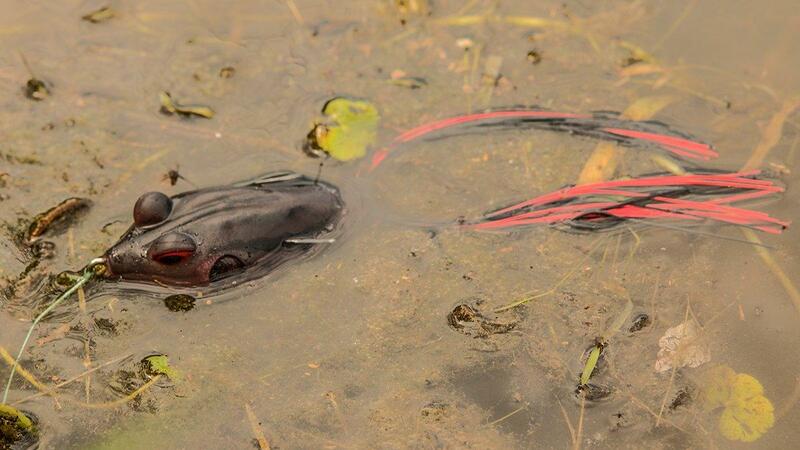 It may look impenetrable to some, but a frog will create some big-time excitement when fished in the right "cheese". Although it will take some time on the water to properly identify, it's important to understand that a mat can, in fact, be too wet. Ideally, you want your frog grabbing the mat every now and again so it will create more pressure waves under the surface. That's a big reason why this bite often doesn't produce until the afternoon hours; the fog and condensation found on cool, fall mornings will make the mat too slimy. As the sun dries it up throughout the day, you'll start getting more bites. Make sure to keep an eye out for "blow holes", or small holes where bass have broken the surface through the vegetation, when you're frog fishing these mats. They're about the size of a small coffee can and the bass will use them as a not-so-covert ambush point. They'll sit under the surface and closely monitor that hole and as soon as your frog reaches the edge of the opening, they'll often explode on it.